Hamilton - Nancy (Buddy) Gaffney 76, beloved wife of David M. Gaffney, died on Sunday, September 2, 2018 surrounded by her family and some dear friends. Born in Los Angeles, CA, she was the daughter of the late Edward C. and Juliette (Adams) Buddy of Westport, CT. She graduated from Staples High School in Westport before attending Garland Jr. College in Boston. 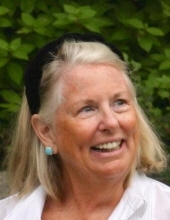 Nancy was a long-time resident of Hamilton, MA and Boca Grande, FL. Nancy was a strong, vibrant, exuberant and resilient woman with an incredible sense of humor and remarkable style. She placed high value on authenticity and fun and sought both with full force. She launched her career in fashion on 7th Avenue in New York City at the age of eighteen. Through hard work and perseverance, she made her mark at Tanner of North Carolina. After she married David and saw their children off to college, she resumed her career as a direct sales consultant, first with Doncaster, a Division of Tanner, and then for the Worth Collection where she was frequently honored as one of the company’s top performers. Nancy also spent several years on an advisory board for a breast cancer support program at Mass General Hospital. Nancy’s proudest achievement was raising her three children with David and maintaining the beautiful Hamilton home their grandchildren affectionately call Grandèe Land. She filled this home with her joyous spirit, often entertaining friends and family around beautiful meals she planned and cooked with pure love. She was a devoted and loving wife, mother, grandmother, sister and friend who will be deeply missed by all who knew her. In addition to her husband, with whom she shared forty eight years of marriage, she is survived by her daughter Brooke C. G. Redmond and her husband, Patrick, of Concord, MA; her son Todd M. Gaffney and his wife, Sarah, of Richmond, VA; her son Trent T. Gaffney of Essex, MA; her grandchildren, Benjamin W. Redmond, William T. M. Redmond, Gretchen C. Gaffney and Spencer M. Gaffney; her sister, Julie de Wolff and her husband, Harold, of Kennett Square, PA; her sister Kate Thornton and her husband, Randolph, of Vero Beach, FL and Quonochontaug, RI; her brother, Mason A. Buddy of Salem; and numerous, nieces, nephews, and cousins in the Buddy, Peltz, Cox, and Perry families. She was also the sister of the late Michael V. Buddy who is survived by his wife, Betsey, of Greenwich, CT.
A celebration of Nancy’s life will be held at the Singing Beach Club, Beach Street, Manchester by the Sea, MA on September 22nd at 11am. All relatives and friends of the family are invited to attend. In honor of Nancy, joyful attire please. In lieu of flowers contributions may be made in her memory to the Pulmonary Fibrosis Foundation, Chicago, IL. .
To send flowers or a remembrance gift to the family of Nancy B. Gaffney, please visit our Tribute Store. "Email Address" would like to share the life celebration of Nancy B. Gaffney. Click on the "link" to go to share a favorite memory or leave a condolence message for the family.